I always start my reviews by saying how am I more drawn into Marvel than DC but now I'm very sure that I'm neither drawn to any in particular. I'm a comic lover so I love enjoying both worlds. Specially now that DC is slowly catching up with Marvel's Cinematic Universe. I strongly believe that DC can do something much better with their property's including a possible union of TV and Film franchise. Why did I think so? Well Legends of Tomorrow just convinced me that it is possible. Just have the chance to see DC's Legends of Tomorrow a couple of days ago. For now I can't discuss spoilers but I'm at liberty to discuss anything that is already shown in the trailers and the backdoor pilot aired within The Flash and Arrow crossover episodes. If you haven't seen those episodes then beware. 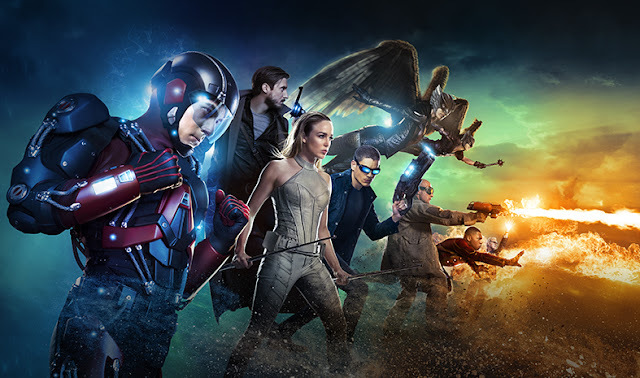 DC's Legends of Tomorrow is the newest TV series from CW network that collects previously introduced characters from The Flash and Arrow TV series. Led by the Time Master Rip Hunter played by Arthur Darvill (Doctor Who), the team embarks on a magnificent journey aboard the Waverider into the Time and Space continuum hunting for the abominable Immortal Vandal Savage (Casper Crump). Joining the team is master inventor Ray Palmer a.k.a. the Atom (Brandon Routh), the master assassin Sarah Lance who is now goes with the name White Canary (Caty Lotz), the tandem of Professor Martin Stein (Victor Garber) and Jefferson Jackson (Franz Drameh) that forms Firestorm, Wentworth Miller and Dominic Purcell as Leonard Snart a.k.a Captain Cold and his partner Mick Rory a.k.a. Heat Wave, the Egyptian Prince Carter Hall/Khufu (Falk Hentschel) and the Egyptian Priestess Kendra Sanders/Chay-Ara (Ciara Renee). First of all I want to correct myself when I said a few months ago that Legends of Tomorrow is just like a Time traveling The Avengers. Now that I saw the first episode, I can confidently say that it is not. Of course it is still not on the league of The Avengers but DC's Legends of Tomorrow definitely caught my attention because of its premise of Time Travel. Now I'm not sure how far will the series flesh out the concept of Time and space because if it is just like The Flash then I will be a little disappointed. For me, to be different, they should center on that idea and with Time and Space on play, the series can open a lot of possibilities including the fan favorite clash of different DC universes from different universes (WB films, FOX, CBS). Doctor Who and other time traveling franchise fans will know this. 16 episodes seems too short but since they are still testing the waters, I will take it. I'm also thrilled to follow a series which is top-billed by lesser known DC characters, that way I'm not pressured to know everything about them in their comic counterparts. Feels very liberating. So are you ready to travel through Time and Space? Then Catch DC's Legends of Tomorrow's first episode tomorrow, January 22 at 9pm on WarnerTV Asia.